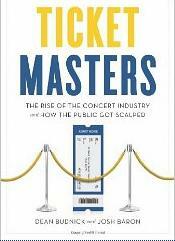 Relix editors Dean Budnik Josh Baron have released a new book called Ticket Masters that documents the history of the concert ticket industry. We’re excited to check it out and we’ll be sure to post a review as soon as we do. Until then, we’d like to pass along a snippet of an interview Budnick and Baron did with the Hollywood Reporter and Billboard Magazine during with they tell a bit of the inside story about Ticket Masters. Q: What’s the biggest misconception about tickets and how they’re sold? Budnick: I think there have been several. Going back a few decades, there was an erroneous sense that ticketing companies were providing a public service rather than striving to maximize their profits, which is why consumers often were so outraged when the service fees would vary based on the price of the ticket. People would question why the fees would be higher on more expensive tickets despite the fact that the service provided seemed to be the same as that for the cheaper ones. Of course the reason for this, is that the ticketing companies believed there was price elasticity and saw a revenue opportunity. Then again, the belief that ticketing should be viewed as something akin to a public utility also was held by many Ticketron executives, which in part led to that company’s demise at the hands of Ticketmaster. Beyond that, I think of a variety of misconceptions endure today. On the core level, I don’t think the public is fully aware of all the elements that make-up a ticket price, which provides revenue streams for the artist, the promoter, the venue and the ticketing provider.